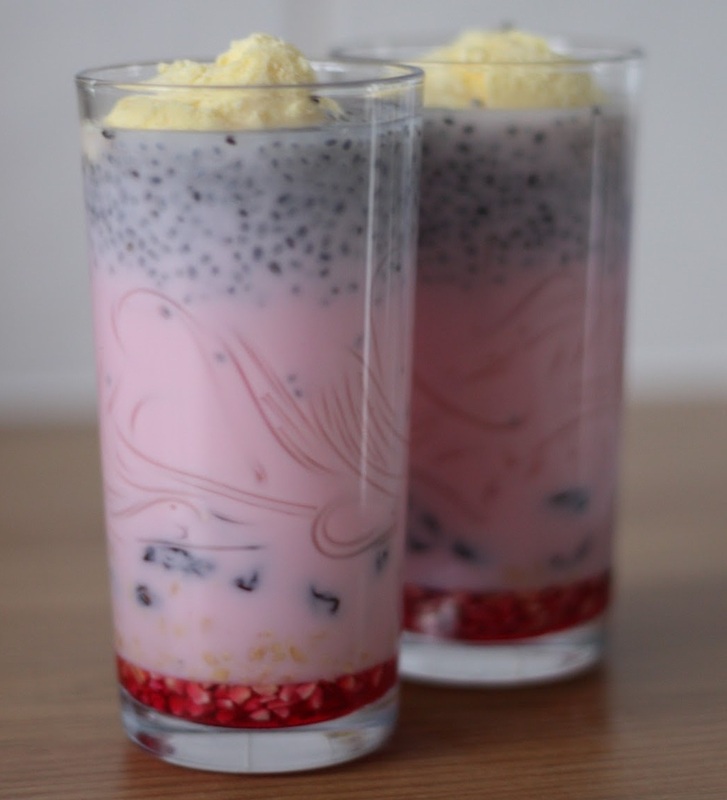 Falooda: Falooda or Faluda is a cold and sweet beverage containing many ingredients very popular in South Asia. 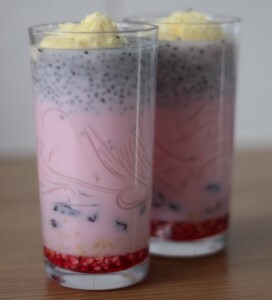 Traditionally it is made by mixing rose syrup with vermicelli, psyllium seeds or basil seeds, jelly pieces and tapioca pearls along with milk, water or ice cream. Nowadays falooda is a popular summer drink throughout Pakistan, India, Bangladesh, Sri Lanka, Myanmar, and the Middle East and is readily available in restaurants and beach stalls. Soak 1/2 tbsp of sweet basil seeds in a cup of water for about 30 to 40 minutes. The basil seeds will swell up. Drain the remaining water from basil seeds. Cook the falooda sev according to package instructions. Rinse the cooked falooda sev in ice cold water. Drain the cooked falooda sev. Let the falooda sev cool down to the room temperature. Prepare the 4 serving glasses. In each glass, add 1.5 to 2 tbsp rose syrup, depending upon your taste. Add in 1 tbsp of soaked basil seeds to each glass. Add in 1.5 tbsp of the falooda sev, in each glass. In a slow stream, pour 1 cup milk to each glass. Top each glass with one scoop of vanilla ice cream. Garnish with a few cherries, slivered pistachios, slivered almonds and slivered cashews. Falooda is ready to be served. If you have any queries regarding the Falooda recipe, please leave a comment.